‘Micro Aggression’ continues the bold attack while ‘Date with the Devil’ is a fun tale that ends with “Came inside her, Satan’s daughter; nine months later, who’s the father? Another day drags, tail between her legs.” Brodsky doesn’t discuss how the date came about, but the results are warning enough. ‘Irons in the Fire’ begins like an ode to both Iron Maiden and Metallica before quickly bringing back the thrash to remind the listener that this isn’t mainstream Heavy Metal here, it’s pure Metalcore! ‘Open Flame’ is a sleeper stand out that felt much like the rest of the album until I sat down and had a good listen to the song. “I tasted open flame, my tongue burned off again” rushes through two verses to get us to a bridge with pounding drums, and here the song breaks down with a guitar figure that feels like the protagonist has taken a much needed breather in preparation for the finale. 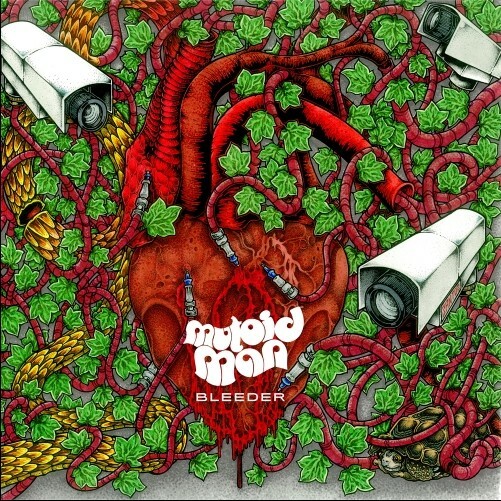 In a world where albums are getting unnecessarily longer to gain hit-counts on streaming websites, Mutoid Man reminds us at a mere 40 minutes the importance of not wearing out the listener by keeping songs at a 3-4 minute length and packing every second with tight playing, massive riffs and catchy melodies. I can’t personally claim to like this more than Bleeder, but that’s just my own taste and perhaps a bit more variety on the tempo and riff front on the previous album, but War Moans has everything that a listener of melodic Metalcore could want: Riffs are furious, chords burn, bass thumps, drums pound, and vocals soar.